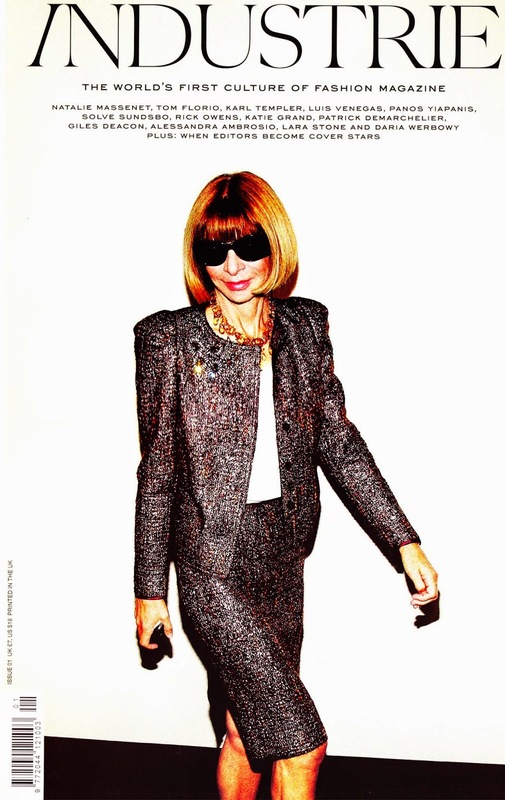 2010 marked the launch of Industrie Magazine and for their debut issue they strategically placed Ms. Anna Wintour on the cover with an understated, inconspicuous image credit. She was typically nonchalant, predictably and effortlessly vague and fooled no one as she distinctly represented herself! There was no character portrayal, no excess wardrobe, no reality escaping fantasy- the cover was a celebration of Anna as Anna. A pretty bold move for an unestablished magazine, especially given the industry pulling power of their cover star and her direct association with what was potentially a competing publication. They were proving a point, one that further cemented their dedication to the culture of fashion, shifting the focus away from trends, instead providing an insight into the personalities and moments that influence and shape our industry. And at first, this defection from the frustratingly untouchable high fashion world was a welcomed distraction. The glorification of street style was a refreshing shift in focus, compelling us to delve into the intrigue associated with, not only who and what people were wearing, but how they were wearing it, where they were going and who they were with. The individual moved into the forefront, it was all about the attitude; personal touches by way of OTT nail art, eccentric phone covers, takeaway coffee cups and the latest magazines rolled up under the arm were equally important, acting as aesthetical props, strategically placed in focus providing intimate insight and extra understanding. The dutiful photographer boyfriend was always in tow and the art of the, “pose,” was mastered, (straight legs, one foot crossed in front of the other, shoulder slightly up, chin down, clutch placed perfectly at your side!). Next to follow, without missing a stylised beat were the bloggers, who were quick to realise the trick to getting photographed and pulling editorial focus, was to dress as ridiculously over the top as possible! The appeal has slowly begun to loose its edge; it’s becoming dry and predictable, accelerating to the extent of no longer having anything to do with fashion at all. It has been converted into a deafening PR stunt, a cutthroat competition of the ugly and the unimaginative. The concept of street style has developed into an exhausting masquerade, comprised of personal attacks on the creative foundations of the fashion industry. Aren’t we tired yet? It’s time to shift the focus, send our appreciation and admirations back to the influencers, the innovators and the shape shifters of the industry. The true individuals who genuinely and actively contribute to the development of fashion, those whose opinions and legacies are so greatly engrained in the framework of the industry, that something as insignificant as a captured moment on the street could never hope to verify and cement the important of their place or validate the strength of their voice. The underlying core of street style was to make fashion seem somewhat accessible and attainable, but what if it’s appeal all along was that it wasn’t? Lack of Passion is Fatal!